I am currently engaged in a series of drawings of the soil where my grandfather and great-uncles served at the Western Front during World War One. Images of these will be posted soon. Over the past two years I’ve been working on closely observed drawings of patches of soil, working with my family’s allotment and the spot where my grandfather was stationed in 1918 when he was injured in a gas attack that left him partially blinded. 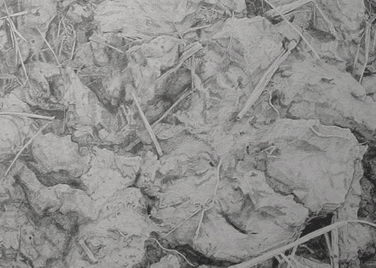 The drawings are of the ground in Flanders; they allow me to question someone and something I cannot access directly. The painstaking work required for these drawings, made both directly and from photographs, have taken me to a place of concentration and knowing. They have been difficult drawings; I have chosen cross-hatch as a technique which does not allow for ambiguity, though the lines have to tell the viewer about shade and contour simultaneously and sometimes in contention with each other. The close examination and representation of a small patch of ground has turned it into a landscape, a space of private and political examination; the ground becomes both an experience of the past and a physical map for future use. I am planning more direct drawings of this site, and I hope to find and draw, and photograph for later drawings, the spot where my great-uncle was killed in 1917, and his CWGC cemetery plot near Amiens.